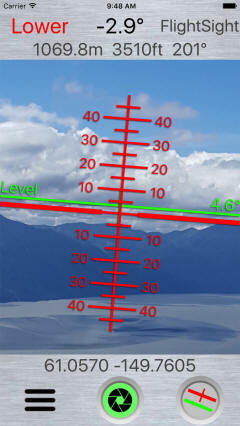 FlightSight is an aviation sight level iPhone app. Its purpose is to help pilots determine whether their flight path is above or below distant objects. 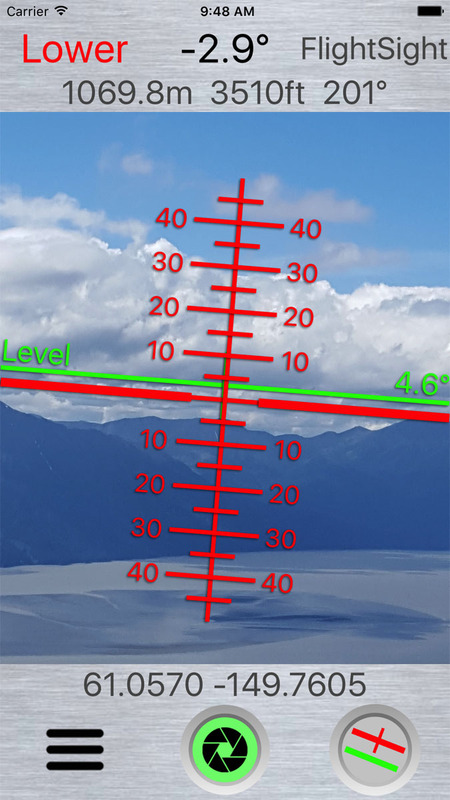 Position the sight target on cloud tops or bottoms, mountain passes or other aircraft and FlightSight will tell you if the object is higher or lower, and by how many degrees. FlightSight can be considered a "low budget HUD (Heads Up Display)"! The FlightSight app can be used by holding the iPhone or iPad by hand. Or it can be used with an iPhone mounted on the top of the instrument panel. Four display modes can be selected when using FlightSight. Fixed target grid, fixed target grid and fixed level line, floating target grid and floating level line (shown here) or floating target grid only. FlightSight can be used on devices in either vertical (portrait) or horizontal (landscape) positions. Finger gestures can be used to zoom the FlightSight view in or out. FlightSight also has a camera option. When you press the camera button the current image will be saved with all FlightSight information embossed on it. Stop guessing, be safer, save fuel … use FlightSight! Use of FlightSight is not an FAA approved method for flight path navigation decisions. FlighSight does not replace good pilot judgment and accurate weather reports. FlightSight is simply a tool for helping pilots confirm their flight path decisions.